The 'summer of migration' has ended. While numerous initiatives still support the 'new citizens', through organising day-to-day support, festivals, language courses and much more, the political class wants to invert this dynamic: they try to erect new borders, enforce deterioration of social standards and to use the refugees to politically divide the working class - as a catalyst for a very far-reaching social re-formation. Within the political left, views on this development can be divided roughly into two sorts: some conceptualise the impressive self-organisation of refugees and the tearing down of border fences as 'autonomy of migration'. Others see Merkel's policies from a solely functionalist perspective: migration is beneficial for capital's interest in cheap, qualified and motivated labour power and in additional contribution payers for the pension funds. In reality these two aspects come together. By migrating towards the northern European centres many people try to become active subjects again. Capital wants to make use of their social energy for the restructuring of labour markets and to put pressure on local class relations. Furthermore, mass migration can have similar effects, like an economic stimulus program, by creating employment in job centres, in teaching, in construction, in the welfare and security sectors... in addition it lowers the reproduction costs of labour power (maintenance and education of a human being during the first two decades of their life costs around 200,000 Euro - Germany is a country of 'old age' and desperately needs young people!). To have this impact proletarian migration must be controlled, something which those in power have increasingly been unable to do in recent years. The most recent stages of this loss of control were the escalation of the 'refugee crisis' in Greece in early 2015, the demolition of the border fences in Turkey in Mid-July 2015 in the aftermath of the fights over Tal Abjad in Syria and finally the trek of refugees from the main station in Budapest towards the Austrian border. In early September the arriving refugees were welcomed with applause in Vienna, Munich and other cities. Apart from the actual border-crisis, this reaction of the local population is the second aspect of the state's loss of control and would have been unthinkable in the early 1990s. Thirdly, the ruling class has no strategy of how to 'fight the underlying reasons for migration'. In fact, the opposite is true: the ever more brutal and destructive repression of oppositional movements in an increasing number of regions around the globe aggravates the social antagonism; crisis and wars result in the collapse of entire regions. The about-turn of the Merkel government in summer was both an acknowledgement of this reality and an effort to re-claim control. The proclamation of a 'culture of welcoming' is part and parcel of this effort. Only by transforming the patient long-term work of refugee initiatives into a public event would the political class subsequently be able to invert it. In the following we want to elaborate on the relation between the migration of refugees and labour migration into Germany within the European context. Initially, the distinction between 'refugees' and 'labour migrants' was a purely legal one: Greek workers who escaped the military junta and came to Germany in 1967 were categorised as 'guest workers’. After the official recruitment ban of 1973, Turkish workers, who were trying to escape from the military coup in 1980, had to claim asylum. Senegalese migrants who risked their lives while crossing the Mediterranean were treated as illegal agriculture workers in Spain and as asylum seekers in Germany. In Germany, the individual and constitutional right of asylum hardly played a role before the end of the 1970s and was mainly applied to migrants from state-socialist countries. In 1980 for the first time more than 100,000 people claimed asylum, about half of them from Turkey and many others from Vietnam and Palestine. A year later 20 per cent of the asylum seekers came from Poland (during the peak time of the trade union resistance of Solidarnosc). During the 1980s there were a lot of left-wing people amongst the asylum seekers, who had to escape from state repression or civil war, such as in Iran or Sri Lanka. They formed the backbone of a political movement concerning the conditions of asylum and against deportations to conflict areas. Bigoted propaganda, which gathered force during the first half of the decade mainly targeted these refugees, who not only brought with them skills and experiences of struggle, but also knowledge about the relations between German capital and the dictatorial regimes in their countries of origin. In addition, during the three years following the annexation of the former eastern ‘German Democratic Republic’ one million internal migrants entered the labour-market in West Germany, people who wanted to escape from the sudden hike in unemployment after industries and administration in their region had been destroyed. The escalation of the ‘refugee crisis’ 25 years ago, like today, formed the foundation for the massive dismantling of welfare standards and standards of collective contracts and labour rights during the economic crisis which kicked in shortly after. The German model of a highly productive export industry, which has been successful for the last 15 years, is based on a working class which is more severely divided and segmented than during the previous decades. On 8th of August 1991 more than 10,000 refugees from Albania stormed the rusty tin-pot freight-ship Vlora and forced the crew to change course and to cross the Adria. The Italian police deported them brutally after their arrival in Bari. This event provided the visual context for the rhetoric of ‘the boat is full’. The liberal political magazine ‘Der Spiegel’ blathered on about migration being the “war of the third millennium” and prophesied the arrival of 50 million refugees from the former Soviet Union (Der Spiegel, 19th of August 1991). While the federal government instigated the fear of an uncontrolled influx of people from abroad it at the same time actually brought more cheap workers from Eastern and Southern Europe into the country, through so-called contracts for work and services (contracts tied to a specific job) and recruitment agreements for specific sectors, e.g. from 1991 onwards more foreign seasonal workers were employed in German agriculture. Labour migration both in its unregulated form and in form of contracts tied to specific projects, e.g. on construction or in the meat industry, exercised an enormous pressure on local workers. The migrants who worked for much lower wages were also systematically cheated out of their wages: sometimes they were paid less than promised, sometimes not at all. This became a trigger for many disputes and some self-organised strikes by workers from England, Ireland and Italy. The unequal treatment of the different groups of migrants created the ground for divisions, fear and pressure on workers to accept the conditions they found themselves in: employed workers against the unemployed, workers from West Germany against the ‘lazy Ossis’ (eastern Germans), re-settled ‘Russian-Germans’ against those migrants who had arrived earlier… and the list goes on. Much like today, the administrative measures first resulted in local ‘emergencies’ or shortages (e.g. in housing) and subsequently to a situation of competition, which could be taken up by the anti-migrant propaganda. The local councils were obliged to house refugees in mass shelters and in most cases they did this by using dilapidated houses without adequate infrastructure. In order to discourage future refugees and stigmatise current refugees the state enforced a very strictly organised mass processing of asylum seekers, in which refugees were not granted benefits in monetary form like everyone else, but in form of food or clothes donations. In some areas the stigmatisation led to violent racist outbursts, but in many places also to ‘civil society’ engagement in support of refugees and to resistance by asylum seekers in the form of food boycotts, hunger strikes and occupations of benefit offices. In order to neutralise these acts of solidarity, pogroms and deadly firebomb attacks were initiated by nazi-gangs infiltrated by the intelligence service. Even in cases of murder the police turned a blind eye. Shortly after the pogrom in Rostock-Lichtenhagen  in August 1992 the government and opposition agreed to the ‘asylum compromise’, substantially curbing the right to asylum. A demonstration of 350,000 people in Berlin became the final exclamation mark of the resistance against the attack on the right to asylum. The change of Article 16 of the constitution in May 1993 was an essential step towards the Europeanisation of the right to asylum. By creating the construct of ‘safe third countries’ the legal procedures were delegated to the EU border-states; the declaration of ‘safe countries of origin’ factually abolished the right to asylum for people from these regions. The next legal change affected the ‘migration law’ [Auslaendergesetz]. The state declared that refugees fleeing war would be granted temporary asylum only as a contingent defined by the state and only for a certain period of time - which meant that residency ceased to be an individual right, but an administrative act relating to a defined group of people that could be revoked at any time. This law was applied for the first time on a big scale to war refugees from Kosovo. Since 1993, the so-called ‘asylum seeker benefit law’ [Asylbewerberleistungsgesetz] created a legal justification for the unequal treatment of refugees when it came to the basic minimum social benefits. Politicians saw the decline of asylum claims during the first decade of the new millennium as a success. All legal regulations in recent years are based on the underlying dictum ‘Germany is not an immigration country!’ and they first of all express the refusal to integrate people in general, meaning, to give them equal rights. During the half century from 1950 to 2000 on average 200,000 more people immigrated to Germany than left the country. During the first decade of 2000 this figure declined sharply and even became negative. During these years temporary labour migration from the new EU-states (Poland, Romania etc.) became the dominant form of immigration. Only in 2010 more people entered Germany than left again: most of them from other EU-states, although a considerable share also came from outside Europe and as asylum seekers. The main origin/citizenship of the refugees changed every year; important regions of origin were the Balkans and the Middle East. The only exact figure in relation to the amount of refugees arriving in Germany is the number of initial applications for asylum. Since the onset of the global economic crisis in 2008 this figure increase slowly at first from less than 30,000 to 64,000 initial applications in 2012, it then nearly doubled to 110,000 in 2013, increased to 170,000 in 2014 and to more than 390,000 in 2015 - which is less by a long shot than the ‘over one million’-figure which is usually used. How many of the one million refugees who had been registered by November 2015 left the country again, either by continuing their journey or by returning, no one knows, not even the administration - they also don’t know how many double or mis-registrations happened or how many refugees evaded registration when facing an ever more rigid interpretation of the right to asylum. The Institute for Employment Research (IAB) of the Federal Employment Agency [Arbeitsagentur]  estimates that around 70 per cent of refugees in Germany will stay there. In many occasions the EU-states lost control, they were not able or willing to correctly register the refugees. Some countries did not pass on the registration figures to the EU-administration, in order not to become responsible for future asylum claims. Both at and between the borders of the Balkan states the refugee treks were frequently and arbitrarily stopped, food supplies and other aid was withheld, producing a situation of scarcity. At other times governments provided free train transport for all those refugees who agreed to subject themselves to the act of registration and to wait for their turn for days under disastrous conditions in registration camps. All this helped to produce images of refugee treks as suddenly emerging ‘natural catastrophes’ which overwhelm the state administrations despite their best efforts. On this background the state leaders justified states of emergency and repressive political measures - in particular once the created conditions led to resistance and refugees refused to display the ‘gratitude’ demanded of them. During the last four decades none of the governments in Germany were able to formulate a ‘migration policy’ in the sense of a complete regulation and control of immigration. Since summer 2015 they have had to come to terms with this fact: wars have moved increasingly closer to EU borders and become more widespread. In consequence many more people have had to leave their homes permanently. The construction of temporary refugee camps in the states neighbouring the war regions is not sufficient to keep the problems from Germany, because these regions are similarly destabilised by the scope of migration and because refugees fight against encampment and its conditions. This is why more and more people arrived in Germany since 2012. In July 2012, of all possible points in time, the federal constitutional court [Bundesverfassungsgericht] ruled that the constitutionally guaranteed ‘dignified minimum level of subsistence’ applied to all people residing in Germany. Although the implementation of this ruling is still waiting to happen, it was a blow to the politics of deterring migrants through lowering standards of welfare. The ruling can only be understood as a result of the broad support of asylum seekers and the persistent resistance against their unequal treatment. This growing movement was also one of the reasons why the state has deported fewer people in recent years. In 2013 and 2014 around 10,000 deportations took place each year, in 2015 this figured increased to 18,360, most of them during the second half of the year - this is a high number of deportations, but it affects only about a quarter of all people who have been refused asylum and issued with deportation orders. In reality the state was not able to enforce the lowering of the quota of recognition of asylum claims to below 1 per cent, which would have meant the factual abolishment of the right to asylum. Since about 2012 refugees who come to Germany have entered a situation that is increasingly characterised by the confident and organised presence of previously arrived refugees, who, amongst others, protested against the ‘residence rule’ (in which refugees were not allowed to leave their designated town), occupied buildings and organised hunger strikes. Out of these acts of resistance the movement of the Lampedusa refugees formed in 2013. This movement gets a lot of sympathy and support from civil society, as shown by the increase in church asylums (people are granted shelter and protection by local parishes), which are supposed to prevent deportations, (currently 450 people in 300 communities have been given church asylum). Another example are the protests of school students against the deportations of their class mates. During the 1990s only a few people on the radical left or within small civil society groupings supported refugees. However, actions against the ‘Fresspakete’ (parcels of food, often of lower quality, issued to refugees instead of monetary benefits) did take place, which in many cases also targeted the charities and businesses that made money with the plight of refugees. Today, in contrast, hundreds of thousands are involved in refugee support as ‘volunteers’, and the ‘left-wingers’ are a minority within them. A study by the Protestant Church claims that eight million people engaged in one way or another in helping refugees in 2015. This engagement, the contact with refugees and with their struggles has radicalised people, e.g. in regards to the involvement of Germany in wars or the role of German exports of weapons. At the same time, the degree of violence against refugees has reached levels as bad as in the early 1990s. Merkel even warned of a “new NSU”. We are witnessing a radicalisation of the political right beyond the organised militant milieu - but today fascists are not able to pose as the executers of a relatively homogeneous social refusal of migrants, their violence is rather an expression of a widening division within society. Pegida  and company blame weaker sections of society for their own fears of social degradation. By declaring migrants to be subhuman they want to enforce the viewpoint that these ‘others’ are not entitled to what they claim. A dumb resistance against the program of modernisation of capital which poses no threat to the latter, but instead helps to promote it. This is why the cops largely allow Pegida to carry on and why in most cases the deep state tolerated firebomb attacks and other violence against refugees. In terms of its impact on the EU the refugee crisis in the second half of 2015 was more severe than the 'Greece crisis' in the first half. The EU drifts apart, the Schengen agreement is in pieces. To be clear: the Schengen agreement was not about the hermetical closure of the EU's outer borders, but the hurdles were (and are) supposed to be high enough that only certain people would be able to make it - those who are physically and mentally fit, who have some money and personal or family resources and are dedicated and highly motivated. In order for this to work the division of labour between the various EU states had to run smoothly as it was designed in the Dublin agreement - but the Italian and Greek governments just pushed the refugees on towards northern Europe without registering them. After that, in 2015, every country just followed its own interests. The eastern European 'front states' categorically refuse to take on refugees, but apart from tacitly tolerating short-term ‘circular’ labour migration [Pendelmigration] they engage in an open-handed naturalisation of people from neighbouring states. The Polish state remembers its 'Polish' minorities in Ukraine, Hungary remembers 'Hungarian' family members in Ukraine, the Romanians welcome their long lost sisters and brothers in Moldavia etc. The approach of these nationalist governments is similar to the German policy regarding the 'late re-settlers' [Spaetaussiedler - Russian-Germans]. The states hope for politically conformist immigrants (who would do the largely badly paid jobs in agriculture or in construction, replacing those 'native' workers who had left the country to work in the western EU states) and continue with their aggressive stance towards certain parts of the population which are supposed to be exempt from citizenship. The Vanguard in this regard were the Baltic states, which expatriated all those people and their progeny who had arrived from other Soviet states after 1940, making them stateless. The systematic exclusion of Roma in south-eastern European states follows a similar logic. Many regions of origin of refugees during the 1990s have become EU member states in the meantime or have settled agreements for immigration without visa requirements. The expansion of EU borders has facilitated the outsourcing of badly paid jobs in the supply industries to these new member states and regulated the migration from these states through gradual 'free movement of labour' [Arbeitnehmerfreizuegigkeit]. For the workers in eastern Europe access to the EU labour market was tied to long-term national transition periods (temporarily restricting entrance of labour), which had been demanded particularly by the German trade unions. During the seven years after the first round of expansion in 2004 people from Estonia, Latvia, Lithuania, Poland, Slovakia, Slovenia, the Czech Republic and Hungary (the so-called EU-8 countries) were already able to work as (formally) 'self-employed' or as employees of foreign companies in Germany, for low wages and low levels of social welfare. In 2011 nearly 470,000 people from Poland lived in Germany, which is more people than from all the other EU-8 countries put together. The EU-2 countries Romania and Bulgaria - which were integrated in 2007 under similar conditions - ranked second and third with 160,000 and 94,000 people respectively. The abolishment of visa requirements for some of the western Balkan states in 2009/2010 led to an additional influx of workers who could be easily blackmailed and therefore forced to work for low wages. Non-EU citizens from Serbia or Bosnia are now able to enter the EU as ‘contract workers’ [Entsendearbeiter] once they have a work contract with a Slovenian or, in the near future, with a Croatian company. In 2014, 60,000 so-called A1-certificates (confirmation of social insurance in the country of origin of the main contract company) were issued for citizens of neighbouring Balkan states in Slovenia alone. Whoever doesn’t have a work contract can enter the EU without a visa and, e.g. by claiming asylum, can obtain at least a temporary right to residence and basic income. A similar scenario is on the horizon regarding the abolishment of visa requirements for the Georgian Republic and Ukraine, which the EU commission has recently recommended. According to the German central register for foreign citizens [Auslaendezentralregister - public administration] from October 2015 the migrant population has increased by 820,000 people within one year, out of which 340,000 people came from EU states, 260,000 from recognised war and emergency regions and 120,000 from the western Balkans. Now around 650,000 people from Romania and Bulgaria are officially registered in Germany; 80 per cent of them arrived during the last five years. The permanent migration from Poland has also increased since 2011; today around 600,000 people from the EU-8 countries engage in full or part-time work in Germany. Since the achievement of full freedom of movement on the labour market in January 2014, the number of people from Romania and Bulgaria working with German work contracts has also increased rapidly. In addition there is a statistically difficult to grasp number of temporarily employed migrants; a study of the Boeckler foundation estimated for the year 2012 that around 800,000 workers had been sent on temporary contracts to work in Germany, 80 per cent of which came from eastern Europe. In general migrants arrive in the EU from two directions: from the Middle East and North Africa and from eastern Europe. In the southern European countries ‘illegal migrants’ are the main work-force in sectors like agriculture, construction and logistics. There is a close relation between ‘external migration to the EU’ and ‘EU internal migration’. Across Europe many young people are try to get away from factory jobs, from agriculture and from manual jobs in general. A major share of young people study for and aspire to a job in the state sector - even if employment is temporary - or want to have a career in a booming branch of the economy. The ‘scarcity of labour’ in the dirty jobs in the fields, on construction sites and in care work is compensated for by migrants. During the boom years after the turn of the millennium, migration to Greece, Italy, Spain, Portugal, … made the ‘uplifting’ of the native younger generation possible. Since the onset of the crisis a lot of young unemployed people from these southern European states who have an academic education, but few job prospects, have moved further north, e.g. to Germany and the UK. During the last years the net-migration of people from the southern European crisis states to Germany was 30,000 - 40,000 each year. In Germany, too, the downward segmentation of the labour market through the specific combination of technical development and migrant cheap labour enabled many young German workers to escape sinking wage levels by moving into more qualified jobs. One example is the regional boom in the Oldenburger part of the Munsterland in western Germany. Although an estimated 25,000 jobs were lost in the meat industry up until the year 2005, during the same period the total figure of livestock slaughter has doubled and a ‘cluster’ of food processing and machine engineering industries was established. According to the estimates of the trade union NGG [food and hospitality] only 10 per cent of all workers employed in the meat industry have permanent contracts, if one includes the unofficial butcher-teams, industrial cleaners and packaging workers, who are normally excluded from the category ‘employees in meat industry’. ‘Officially’ a quarter of all workers are employed as migrant contract workers of foreign companies - nearly seven times as many as in 2011. In construction this development had already taken place in the 1990s. Back then the trade union IG BSE tried to push out competition from cheap labour by calling workers to denounce other workers who were employed without contracts or residence permits and by calling for state organised raids - all of which helped to instigate a racist atmosphere. Via a collective agreement the regulation of migrant contract labour [Arbeitnehmerentsendegesetz - employee assignment law], which was passed in 1996 and initially only applied to the construction sector, led to the introduction of a sectorial minimum wage for construction workers - separate wages for workers in East and West Germany. An important aspect of the law is that it assigns the final legal responsibility to the main construction contractor. This makes it possible for workers to claim outstanding wages even in the case of the bankruptcy of a sub-contractor. The expansion of the scope of application of the ‘employee assignment law’ beyond the construction sector first in 2007, then in 2009 and lastly in 2014 refer to those branches with a high proportion of migrant labour: cleaning, various construction jobs, refuse and recycling, elderly care, laundry work and the meat industry. Facing the crisis in eastern Europe, (skilled) workers left for Germany in increasing numbers - and they arrived at the right time for the expansion in Germany of the ‘low wage sector’ to the logistics sector in its wider sense, e.g. through the introduction of ‘service contracts’ or ‘contracts for work labour’ [Werkvertraege]  in the automobile supplier-industry and in assembly departments of the main car factories, where people once used to earn big money. The German trade unions were largely able to maintain their social peace with capital based on the low wages in the supply-chains in eastern Germany. The unit labour costs of the workers in the core companies could be lowered through ‘rationalisation’, intensification of work and flexibilisation of working hours, but their annual wages remained more or less stable - which allowed the unions to portray themselves as ‘good representatives’ to their membership and as ‘efficient partners’ to management. Workers in the core companies were disciplined by the threat of ‘worse conditions’ in the industrial margins and by the de-regulation of welfare rights. The increasing segmentation of the labour market excludes local workers from certain jobs: for example, if a particular work-force is recruited through Romanian sub-contractors a German person wouldn’t be able to get a job in that work-force, even if they wanted to - this is equally true for countries in southern Europe where very high degrees of youth unemployment are accompanied by a high level of employment of migrants. Early on in the 1990s, second generation migrants – particularly children of ’guest-workers’ and of so-called ‘Russian-Germans’ [Aussiedler - re-settlers] - were marginalised on the labour market through the employment of recently arrived migrants. Previously it usually took about one generation for migrants to fight themselves into the labour market and obtain equal conditions. This is not the case anymore. Today, for many of the second-generation migrants ‘social mobility’ means becoming the lower level ‘middlemen’ of a mafia-economy, mediating between the ‘German economy’ and more recently arrived migrants who share their language, as landlords, labour gang-masters and subcontractors. 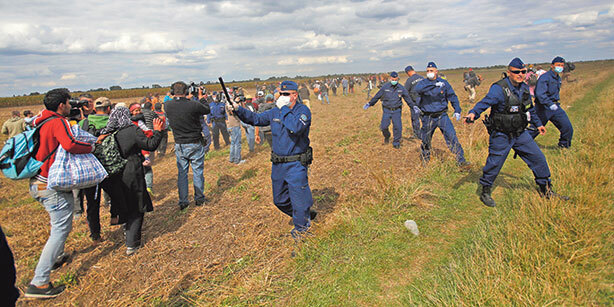 Migrants from eastern Europe resist. Striking workers in the meat industry are sometimes attacked by armed groups, sent by the company. The trade unions and the core work-force do not participate in these struggles and they see media reports about them as threats to the companies’ viability. They try to push out ‘cheap competition’ from the companies or sector by systematically treating these (migrant) workers as unequals. Only from 2012 onwards protests by migrant workers became increasingly public. For many migrants making use of the media seemed more promising than actual strikes, and the legal advice from some of the trade unions and from church institutions supported that view. At least the low wages are nowadays seen as a public scandal - though in small towns or in the countryside in social situations where many local people benefit in some form or other from the exploitation of migrants (e.g. as landlords, shop-owners) open and direct confrontations are difficult. Protests are therefore mainly organised around language groups or national communities, or around work-gangs and sub-contractors which are based in these communities. In Lohne or Emsdetten (rural small towns in western Germany) demonstrations by supporters have never managed to gather more than 200 people in the streets. The access to social security and legal rights granted by the formal ’freedom of movement for workers’ [Arbeitnehmerfreizuegigkeit] offers a certain security for the individual person, but does not entail an equal status with German citizens. The state wants to prevent that entitlement to social benefits also in times of unemployment makes it more difficult to pressure migrants into badly paid jobs and to keep badly paid jobs. Therefore the state creates new possibilities for blackmailing migrant workers by increasingly intertwining social legislation and the right to reside. For example, for EU citizens residing in Germany the ‘freedom of movement of workers’ is only granted for six months and only on the condition that they have their own income and that they are covered by a health insurance policy. Only after five years are people entitled to a permanent right to reside and to HartzIV unemployment benefit. Prior to the five years, staggered entitlements and rights are applied. According to the decision of the European Court of Law an individual obtains worker status once they work at least 5.5 hours per week (which equates to 200 Euro per month on a minimum wage). People with worker status are then entitled to ‘in-work benefits’ under HartzIV to prop up their wages. Amongst other reasons this explains the high numbers of so-called ‘mini-jobbers’ amongst migrants from EU-2 states, but also from Poland: many people work full-time unofficially and receive ‘in-work’ benefits for their official part-time or ‘mini’-job - as many ‘German’ workers do, too. In contrast to their German fellow workers the migrants are less able to break out of this arrangement: if you quit the job or lose it by standing up to your boss you run the risk of losing your right to reside due to unemployment. After one year of full-time work people are entitled to half a year of unemployment benefit (income based), plus half a year HartzIV benefit (minimum social welfare payment). Many social welfare administrations inform the migration office once people claim benefits, the migration office then orders people to leave the country - this also happens to EU citizens from the ‘core states’, e.g. Spain or Italy. The bureaucratic intertwinement of the administration responsible for work and welfare on one side and the migration office on the other - which has been proclaimed as a future way to deal with the refugees - is already a reality for labour migrants. This following a certain logic given that the campaign against ‘asylum abuse’ targeting refugees from Balkan states was immediately proceeded by the propaganda against ‘poverty/benefit migration’ from Bulgaria since the end of 2013. There are two opposing poles within the ruling class: liberalism, whose most consequential proponent is the Green Party, demands the opening of the borders and the deregulation and down-sizing of welfare benefits and social guarantees; whoever wants to come here should do so, but has to figure out how to survive by themselves. The other extreme is represented by some members of the deep state and on the political stage by NPD/AFD/CSU (parties of the political (far-)right) and parts of the SPD and CDU: closure of the borders, intensification of migration controls, further bolstering of the policing forces. The current process of negotiation oscillates between these two poles, but they both have a common main goal, as can be seen in the debate about the migrants’ ’duty to integrate’ [Integrationspflicht]: they want to turn the migrants into something like ‘Turbo-Germans’ and use them to enforce the re-structuring of the European labour market - secured internally and externally through the ‘War on Terror’. Depending on the sector, employers want to prescribe different roles to refugees on the labour market. The IAB predicts that the ‘numbers of people who can potentially be employed’ [Erwerbspersonenpotential] amongst asylum seekers will increase by 380,000 people in 2016, after it has hardly increased in 2015 (according to ‘migration monitor’ [Zuwanderungsmonitor], November 2015). According to the magazine Spiegel Online the ‘expert council for economic development’ [Sachverstaendigenrat zur gesamtwirtschaftichen Entwicklung]  predicts only a slow rise in the employment of recently arrived refugees, stating that over the next two years hardly more than 100,000 people will enter the labour market. In mid-October an open dispute over the integration policy erupted within the employers’ camp. Michael Knipper from the Association of the German Construction Industry [Verband der Deutschen Bauindustrie] lamented the “uncritical euphoria amongst large parts of German industry”. The construction industry is a very cyclical/seasonal and transnational sector with a largely migrant work-force. Employers in the sector don’t bank on the ‘know how’ of a local working class and ‘innovative abilities’, but on the re-structuring and lowering of production costs enforced through increasingly worse pay and conditions. Some employers in the manufacturing industry have a different perspective. They desperately need ‘fresh energy’ in their companies and they look for workers who still believe in careers and want to do something about their upward mobility - characteristics which large parts of the second and third generation of migrants learnt to give up on a long time ago. To professionally qualify and to make them feel a long-term loyalty towards the companies and their fate in Germany, refugees are required not only to have a secure residence status and to take language courses, but also to break their ties with their country of origin. Whoever has to send money home will not get by on the relatively low wages paid during apprenticeships and so will instead take the minimum wage doing unskilled jobs in a warehouse. This is why capital needs a mixture of pressure and promises of future prospects when it comes to the refugees. Since the 1st of August 2015, refugees’ “integration into the labour market” starts with work that pays below the minimum wage, e.g. through long-term internships or courses to obtain ‘basic skills’ [Einstiegsqualifikation, (EQ)], whose maximum length has just been extended from six to twelve months. This period can be easily extended and authorities can sign young adults or the long-term unemployed up to these courses before or after an actual apprenticeship by using the argument that they have a “lack of employment skills”. The pressure to accept this extension of low paid work is built up by the fact that people lose their right to reside once they lose their job – the real “intertwinement of job centre and migration office”! The migration regime of the EU is only able to function if it manages to structure labour markets beyond its own territory. Economic agreements such as the Euro-Mediterranean Partnership (EUROMED)  are accompanied by political-military cooperation. Agreements about the military securing of borders and the taking back of unwanted migrants also contain, as a ‘bonus’, the offer of temporary labour migration (usually tied to a specific work contract) from different regions outside of the EU to the EU, as laid out,i.e. in the ‘EU-mobility partnerships’ with both Mediterranean or eastern European states. Turkey plays a strategic role as a door-keeper in the south-east. During the G20-summit in Antalya a three billion Euro deal was forged, according to which the Erdogan government is supposed to grant residence rights and permission to work to Syrian people in Turkey and at the same time deport other refugees back to their country of origin. In return for the closer policing of the EU external borders by Turkey the EU considers liberalising the visa requirements for Turkish citizens and thereby also expand the possibilities for Turks to work inside the EU. Such agreements rely on the cooperation of all of the state actors involved, but governments in Pakistan and Afghanistan recently refused to ‘take back’ their state citizens deported from the EU. And no amount of money will stop the Erdogan government from opening borders or closing them or provoking military conflicts etc. as part of its fight for political survival. Neither was the grand-sounding final declaration of the EU-Africa summit on Malta at the beginning of November 2015 able to disguise how little control states have over migration. The political calculation of the EU to detain the big masses of refugees in its neighbouring regions and to let people enter temporarily and to push them back again when needed, would only be able to succeed if there were possibilities of living and working in these regions. These possibilities seem further out of reach than ever, not only in northern Africa, but also in the Balkans, such as in Kosovo. This is why the EU frequently opens safety valves and temporarily opens its borders. In the case of some of the Balkan states new recruitment agreements were settled in summer 2015: from 2016 onwards also “less qualified” workers from the western Balkan states (who already reside in Germany) are allowed to work in Germany if they can prove they have a concrete apprenticeship or job offer - but only under the condition that they withdrew their application for asylum by 24th of October 2015 and returned to their countries of origin (in order to re-enter when required). Workers’ work [Arbeiterarbeit], meaning general manual labour - whether in agriculture, construction or in manufacturing/industries - is increasingly performed by migrant workers. Migrants put up with this work because they are used to worse. Organising struggles together with their (local) work-mates is difficult in situations where migrants are used to lower standards in general - and even more difficult, if the ‘higher income strata’ (landlords etc.) benefit from the migrants’ over-exploitation. During recent years migrant struggles emerged mainly in work places where the vast majority of the work-force were migrants, e.g. in the agriculture or logistics sector in Italy. In Germany, where access to the labour market is very regulated and multiply segmented, there have been many conflicts, but hardly any major struggles of migrants. During 2015 refugees not only forced the government to change its course and thereby also politicised hundreds of thousands of supporters, but through their mass they made issues such as wages, working conditions, housing etc. in to ‘public’ issues. None of these issues will solve themselves, they are all contested and conflicted. The state creates competition, e.g. in terms of housing supply when more social housing was built again, but initially only for refugees. This is why the struggles around housing and the current occupations are of such importance! They are about affordable housing for all. The hegemony of the political right in some regions is based on social insecurity, which does not just derive from fear of material losses. The increase in capitalist competition also dissolves familiar social networks and a personal social environment. It is evident that a clear ‘antifascist edge’ is needed to fight back against the cultural hegemony of the political right - but a ’cultural struggle’ alone is not enough. We have to develop further ideas on how to relate our actions to social antagonism. Due to the arrival of huge numbers of refugees the potential to do this is higher than in recent years. We can take up the questions raised by refugees and make them public, common, social questions again. The radical left can also support migrant struggles by helping overcome community boundaries - this is where self-organised language courses become useful. The resistance against deportation and for a right to reside is a precondition for struggles to develop - and here we refer less to legal decisions than to practical resistance against repression, against policing, against raids in town and at work. Wherever we support refugees, we will be confronted by the state - according to the situation the state will make offers of integration or will attack repressively. We will only be able to oppose both options once we start from the conditions of the entire class - and once it is clear that we definitely don’t want to get integrated into the state ourselves. “In 1988 the numbers of asylum seekers again crossed the 100,000 mark. During the year of the European Revolutions in 1989 this number increased to 120,000. In re-unified Germany in 1990 around 190,000 asylum seekers were recorded, in 1991 nearly 260,000 and finally in 1992 nearly 440,000 - by then many of these people came from East and South-East Europe, mainly refugees from ex-Yugoslavia, but also Roma from Romania. National Socialist Underground (NSU) is a fascist terror-group which killed several migrants during the 2000s and which was heavily infiltrated by agents of the intelligence servive. Patriotic Europeans Against the Islamisation of the Occident (Pegida) is a right-wing platform which revived the ‘Monday-demonstrations’ in the east of Germany, this time against muslim and other immigrants. Pegida demonstrations spread from eastern towns like Dresden to other towns in Germany, mobilising up to 10,000 people. What has been decided in the ‘law for the acceleration of asylum proceedings’ [Asylbeschleunigungsgestz]? It is evident that a clear ‘antifascist edge’ is needed to fight back against the cultural hegemony of the political right - but a ’cultural struggle’ alone is not enough. We have to develop further ideas on how to relate our actions to social antagonism. Very interesting reading, it explains a lot. If I had the time and skill I'd write a similar piece on Sweden. Thanks for translating. 2) contribute to undertake a similar analyses of immigrant labour in the Netherlands. hey, if you do stuff like this we would really appreciate it if you would also Edit the article and upload the PDF to the File attachments section. Of course feel free to put in a credit to you or your blog in the PDF as well! I'd be happy to do that, getting credit doesn't matter, but the 'Edit' tab is only visible to me on certain articles, not many of the one's I've turned into pamphlets. For instance, at the top of this article there is no Edit tab, so i cannot upload the pdf.